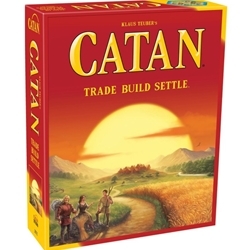 One of the most successful games of all time, Settlers of Catan is a trading and building game set in the mythical world of Catan. Players roll dice to determine which resources are generated each round and then must strategically trade those resources with other players to get what they need to build their settlements, cities, and roads. With multiple ways to gain victory points and a board that changes in every play, Settlers of Catan is a game that can be played hundreds of different ways. The base of a hugely successful franchise, with multiple engaging expansions, Settlers is the core game of many collections, and is a wonderful way to spend time with family and friends. For 3 to 4 players. Our family favorite, Hands down!! Good replay value. A nice combination of luck and strategy. Several recommended scenarios but also the ability to customize it yourself.